Good ol Stang cheeseholed frame and polcarb tubing. I love it. From the drivetrain up, it is certainly a 111 robot. May I ask why you went away from your standard 4 wheel swerve? You’re forgetting the clear roller tubes with tye-dyed “alliance partner lotto” balls in them! They may have ruled it out when the motorola shop closed and were unsure at the time they would be able to manufacture their parts. That robot needs more colors. Only orange on the rollers? What is this. Yeah, thats what I’m wondering–was it due the uncertainty surrounding manufacturing the parts or just feel the 6 wheel is better. 1625 and 118 went away from their traditional swerve, so perhaps we are seeing teams start to go away from them. I think 118, 1625, and 111 chose 6WD or 8WD over swerve is because they think it’s the best drive for this years game. 1625 has the 10 wheel lobster drive. I think 118 went with 8 wheel because their design doesn’t go well with their traditional swerve and turret drive so they decided against it. not sure why 111 went away from their usual swerve. I’m so confused. That lift doesn’t look like it goes up to 20 feet at all. 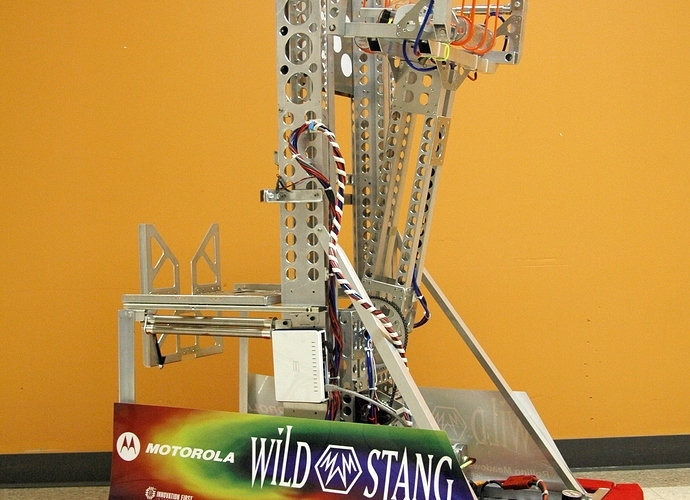 I thought all Wildstang lifts went that high! The decision to go with a 6wd base was based purely on on strategy for this year’s game and not on machining capabilities. We couldn’t go with a wide robot because it wouldn’t fit through the gap between the tower and the wall at the end of the lane. We also believe that speed is important in this game which means a shifting transmission. After those realizations, the choice was simple. We made the decision the day after kickoff. A few members of our team have been (not so secretly) itching to try 6wd for years, but our game strategies & priorities haven’t allowed it. 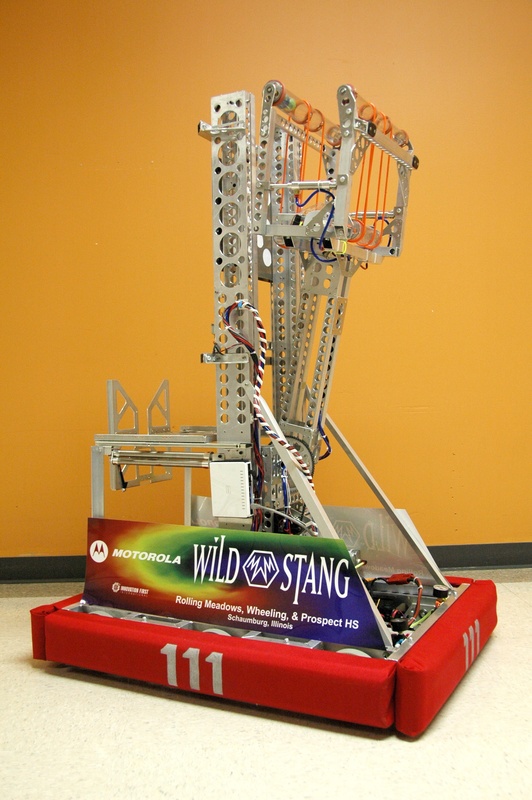 I’m glad we finally got to build one this year; it’s by far the most fun Wildstang robot I’ve driven. Officially it was only designed for 19.5’ but we have it limited in software for much less. Cmon, you know we’re engineers right? We make it go just high enough. Remember the half full glass joke?